Bulls Season Ticket Holder Bill Thomas comments on the plan to introduce a Winter Break in the Premier League from 2020. Whilst I fully understand the need for a winter break in the Premier League, I am very concerned about the suggestion that the Fifth Round of the FA Cup might be moved to midweek, with no fifth round replays. 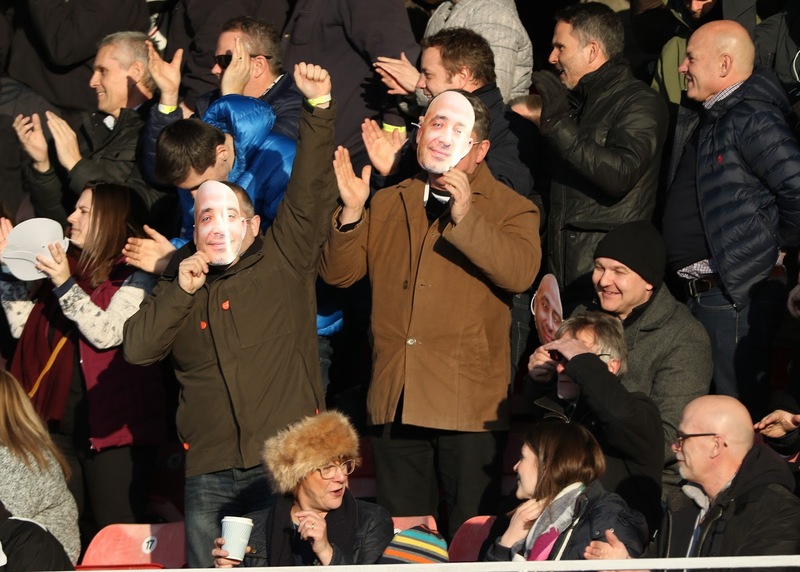 If the Fifth Round was played in midweek, it could reduce its profile, and make it more difficult for spectators to attend the matches which would be a shame. And not having fifth round replays would only cut one potential fixture, so I can understand why some clubs are concerned that no Cup replays might be extended to other rounds of the competition. In my opinion the best way to make space for the Premier League break would be to make the League Cup into a Football League only competition. The required number of Premier League games could then be transferred to the dates that the early rounds of the League Cup are currently played, and this would create the space for the break. This change would save the top Premier League teams a maximum of seven matches a season, which I think would freshen up the players far more than a potential one game saving. I also think that the League Cup could be more exciting as a Football League only competition as there could be more teams that could realistically win it. I also feel that the proposed break needs to be about a week longer and start a little earlier, so that the players are refreshed but fully warmed up when the Champions League knockout matches start. A Football League only League Cup should free enough dates to allow this without any changes to the FA Cup apart from possibly playing playing some of the rounds on different weekends. I accept that my suggestion may not be the best plan for the top clubs financially, but I think it could create more success for the England team and more success for our club sides in Europe. Bill Thomas ... Bradford on Avon. Given it's a slow news day, a chance to look back to February 28th 2012 when Hereford lost a nine goal thriller at Gillingham. Secondly read the BN report. The Bulls dropped dangerously close to the drop zone when they lost two-goal leads twice at Priestfield this evening to finish on the wrong end of a 5-4 result. Pitman sprang one surprise naming Danny Williams in a starting XI that included a return for Michael Townsend with Featherstone failing to make the squad. The Bulls were quickly off the mark when Barkhuizen broke into the box in the second minute and was felled by Jack Evans. Purdie stepped up and coolly stroked the ball in from the spot. Gills fans had barely recovered before Barkhuizen doubled the lead when he cut in from the left to meet Facey’s flick from Clist’s searching forward ball and finished from close range on seven minutes. Cornell made a fine save from Tomlin and Towner got in a saving challenge as Kuffour prepared to shoot. Jack Evans broke away and crossed for Tomlin to sweep the ball into the net but the strike was disallowed as the referee’s assistant made a timely flagging interception to the proceedings. Lunt dinked a through ball into the path of Barkhuizen but King was quickly across to launch a clearance into the stand. Then Facey produced a similar cross to the one that resulted in the goal at Bradford but Taylor’s header was saved. Whelpdale and Evans combined to craft a chance for Kedwell but Anthony got the block in and Purdie, busy ratting in midfield, whipped the ball away from the former AFC Wimbledon man as he closed on the penalty area. The hosts pulled a goal back when Jackman drove a cross to Whelpdale who volleyed home from 12 yards with 44 minutes on the clock. As the half drew to a close, Kuffour fired wide and Whelpdale saw his header go over. The second period started disastrously when a long throw found the Bulls’ defence too deep and Kedwell nipped in to poke home with just 35 seconds played. 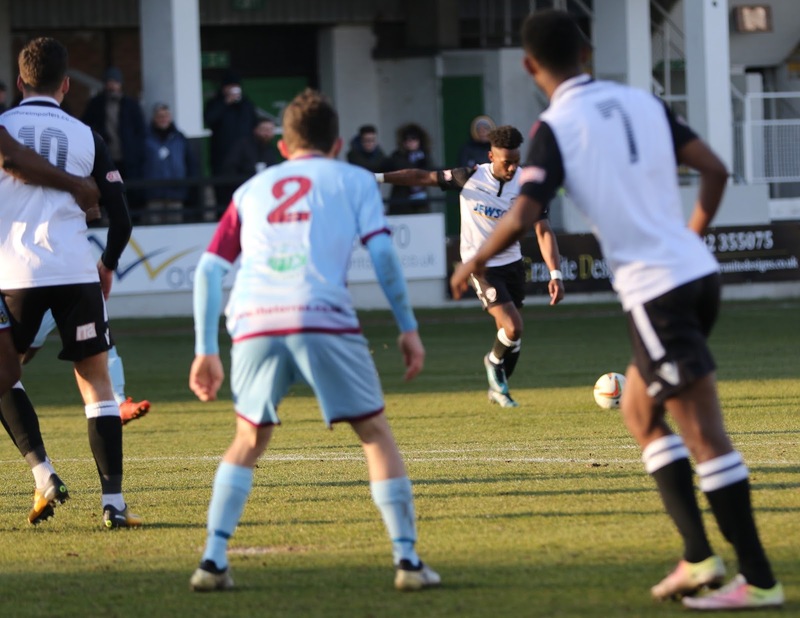 Taylor sent a rising shot over the bar as Hereford strove to regain control but the home side were quick to restore pressure on Cornell’s area with a barrage of dipping crosses as they looked to push The Bulls onto the back foot. Another Facey flick almost put Barkhuizen in on goal but Essam was quick to get in the clearance. Townsend, Anthony and Evans all conceded free kicks as The Bulls made hard work of clearing their lines but a Facey/Barks combination drew a fine save from keeper Gazzaniga. Lunt played a ball up to Facey who laid off to Evans but his shot was high. Then Kaffour missed a chance when through on goal. 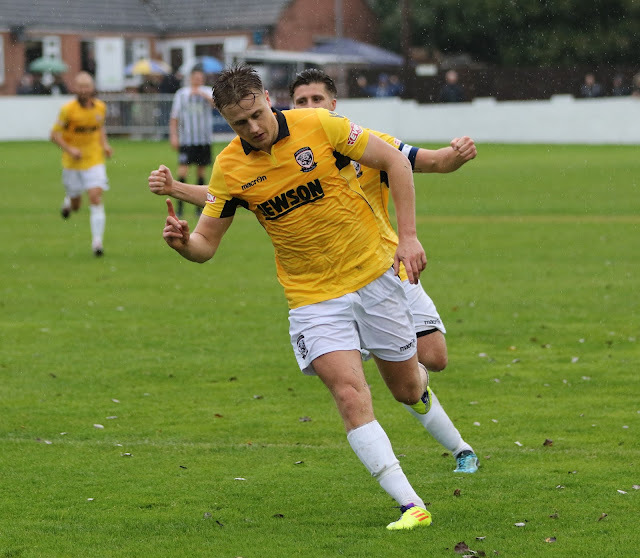 Then The Bulls regained the lead against the run of play when Kenny Lunt fed Purdie down the left and his clever pass put Evans in to shoot and when the keeper was only able to parry the shot Barkhuizen was on hand to force the ball home. Almost immediately, Towner conceded with a clumsy challenge on the edge of the box but some desperate defending kept the ball out. Clucas came on the replace the injured Danny Williams who went down under a crunching challenge from Weston. 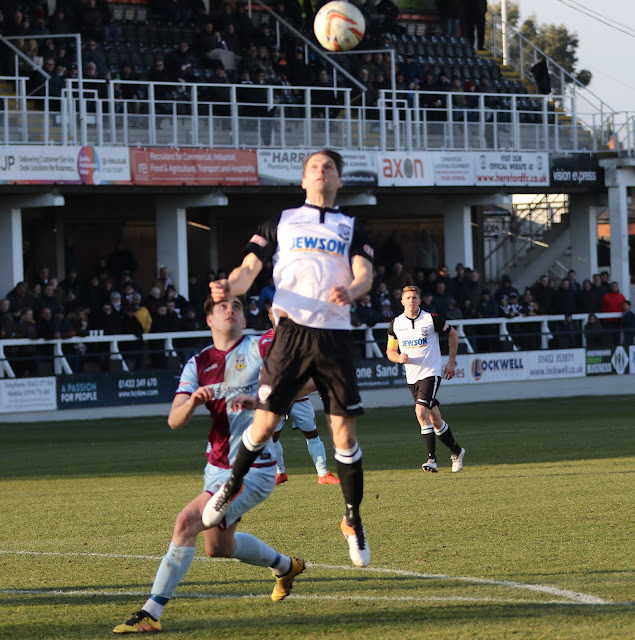 Then Facey produced another fine cross for Evans to thump a header home to give the Bulls a fourth goal but Charlie Lee was allowed to run at Cornell’s goal unhindered to fire home the hosts third straight from the restart. Lunt and Facey linked up to win a corner but Gazzaniga got in a punch to clear. Barkhuizen broke away and fed Evans whose shot was finger tipped away for a corner by the home keeper. Then with just minutes remaining The Bulls deep defending cost them another goal when Lee grabbed a late equaliser. With everyone thinking that nothing more could happen, Gazzaniga who should have been dismissed upended Barkhuizen in the box but he stayed on to save Purdie’s spot kick when he should have been in the showers. Then in a final show of suicidal defending The Bulls conceded right at the death when Tomlin swept home from just outside the six-yard box. Hereford; Cornell, Williams (Clucas 74), Townsend, Anthony, Clist, Barkhuizen, Lunt, Evans, Purdie, Taylor (Colbeck 82), Facey. Unused subs – Bartlett, McQuilkin, Elder. Gillingham: Gazzaniga, King, Jackman, Essam, Evans (C Lee 46), Whelpdale (O Lee 77), Kuffour, Kedwell, Tomlin. Unused subs – Hawkes, Davies, Montrose. Attendance 3784 with around 50 diehards. The Bulls will no doubt cite the failure of the referee to send off the Gills’ keeper when he was clearly the last man but to lose a two-goal lead twice in the same match is about as careless as it comes. Too many times the defence backed off and dropped deep into their own box to allow chances to the home side in an area that gave Cornell little time to react. For the Gills fans, obviously the former – last night’s game had everything – 9 goals, penalties scored and missed, all that was missing was the sending off – and for us that was the catastrophe. At the end of the game last night I felt shell shocked - sick, sad and desperately disappointed. How many Hereford fans have seen us score 4 and still lose? Well the 45 or so of us at Gillingham went through every emotion possible during the game and the frustration felt by some at the end was understandable. We were up, down, up, down and eventually out. The post mortem will not change the result. Why can’t we hold onto a lead? Why didn’t the referee send off the Gills keeper? Should Purdie have taken that final penalty when he was injured? The questions keep coming but the only comfort to be found when I got home was that we were still 22nd in the league. If, at the end of the season, we are still above that dotted line, I’ll see Tuesday night as one of heroic failure, a classic I was privileged to see. However, at the moment I’m not that optimistic. There were some positives out of the night – we scored 4 goals (a first in the league this season), Tom Barkhuizen was magnificent (where would we be if we hadn’t had him with us this year), we held on for 41 minutes before conceding, there was no lack of effort ... but then I’m struggling. I so desperately wanted Pitman to succeed this year but I think I underestimated the contributions people such as Lennie Lawrence and Dave Kevan made last year to our survival. Such an experienced and cool head has been lacking this year and I’m not convinced about Gary Peters. Keyte and Russon have done well off the pitch – the revamp of the Starlite rooms and community involvement particularly with local schools stand out, but the decisions made on the pitch have been naive in the extreme. The reality is a lot of the players who tried so desperately last night, will still be with us next year but sadly Barkhuizen won’t. While signing up young prospects such as Pell and Evans makes sense, I’m amazed how many others have been signed up when we have no idea where we’ll be come 5th May. Sadly I have no answers, just endless questions. The reality is Tuesday’s game could make or break us. The confidence we gained going forward or the doubts at the back. Every team we play will know how vulnerable we are and yet there are a lot of relegation rivals who are also struggling who we face in the next few weeks. Plymouth can’t see out a game (thankfully), Barnet are on the slide(but I really don’t want them to go down), Dagenham are as likely to implode as we are and Northampton are yet to be consistent under Adie Boothroyd. 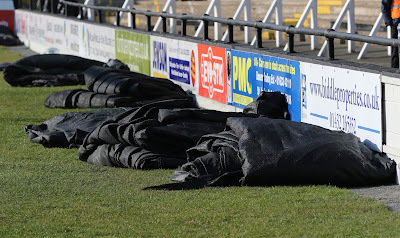 So it’s back to Edgar Street on Saturday, with one eye on the score board to see how our rivals are faring. I subscribe to a website that sends me verses from the Bible on a daily basis and today’s came from Psalm 120 – “I call on the LORD in my distress, and he answers me”. Respectfully I suggest we all start praying! 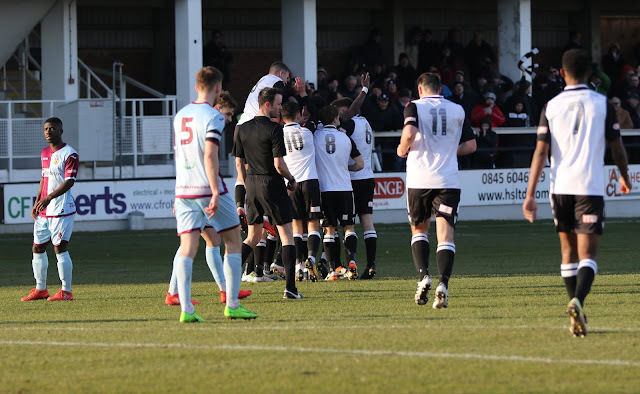 Hereford United win 3 - 1 on penalties, after extra time. FA Umbro Trophy Fifth Round Replay. 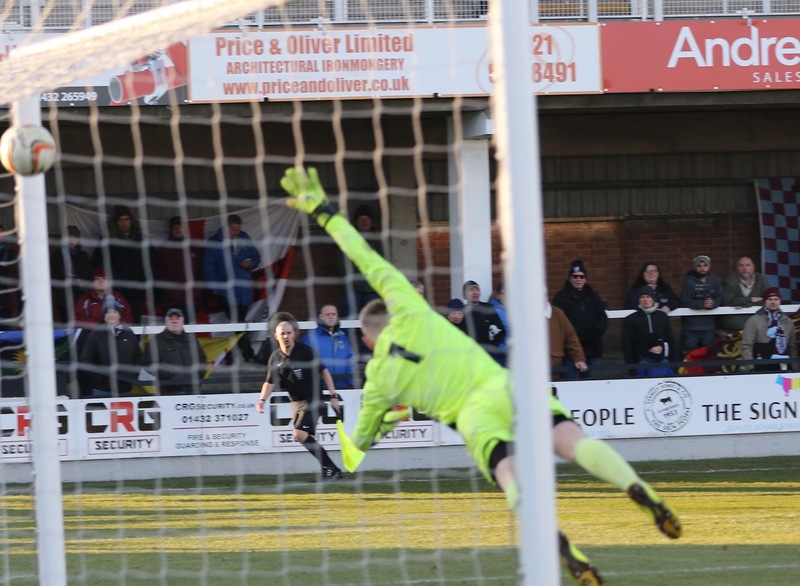 Hereford United earned a home match against Burton Albion in the quarter final of the FA Trophy after a lucky win on penalties against Morecambe tonight. After a 0-0 draw on Saturday at Christie Park, the Bulls were favourites for the replay but Morecambe dominated for long periods and will count themselves very unlucky not having progressed themselves. 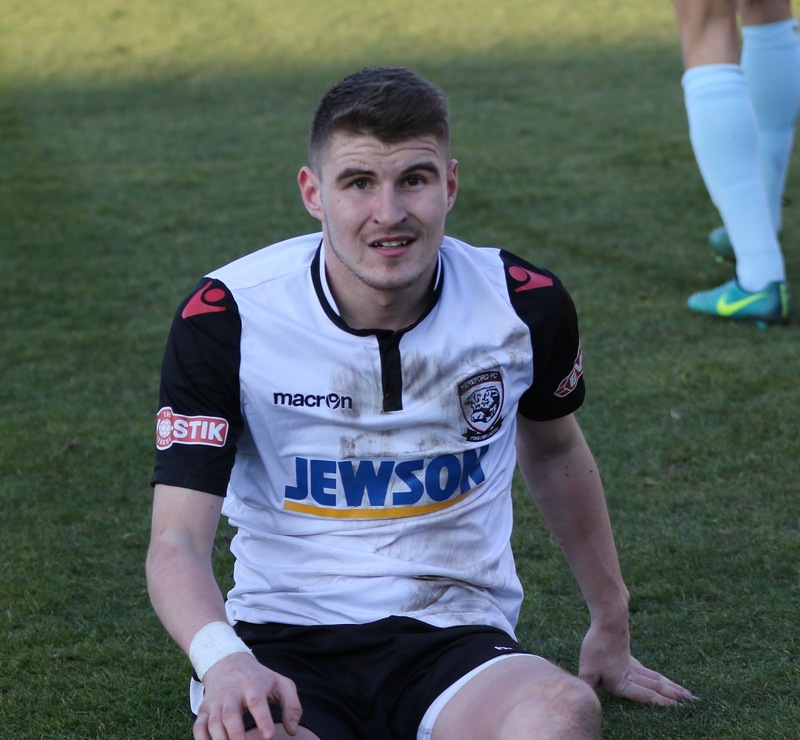 Paul Sturgess recovered from an injury to start the match, so Hereford named the same side that drew with Morecambe on Saturday. Ian Wright missed out with a hamstring injury, and Paul Parry was also still out. Craig Hanson chipping his elbow in training, and Andrew Moran didn't fully recovered from a groin strain. The Lancastrians were without the cup-tied Robbie Talbot, but otherwise manager Jimmy Harvey had a full squad to choose from. The majority of the half was dominated by the Shrimps, who brought fourty hardy followers down who made themselves heard on the night. In the opening fifteen minutes, the Bulls were atrocious and Morecambe looked like they would bury the home side in the first half. 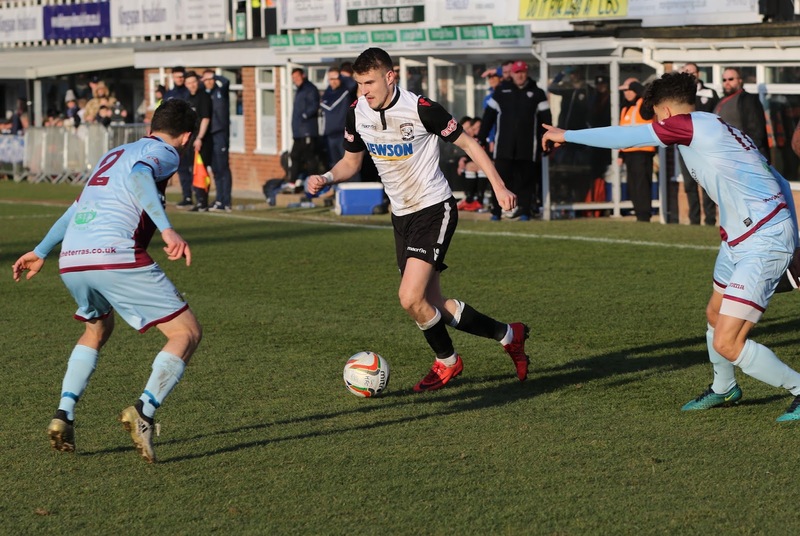 The only Hereford efforts came from Jimmy Quiggin, Tony James and John Snape, but their long range efforts failed to hit the target as the attacks of the home side were severely restricted. Rob Elmes hit a corner just wide. Morecambe will feel that they should have gained a penalty just a minute before the break, as Matt Clarke appeared to foul a Morecambe attacker, but the referee waved the protests away. An unexpected goal came on the stroke of half time as Ian Rodgerson came crashing down in the penalty area, an outstretched leg from John Hardiker stopping his run. 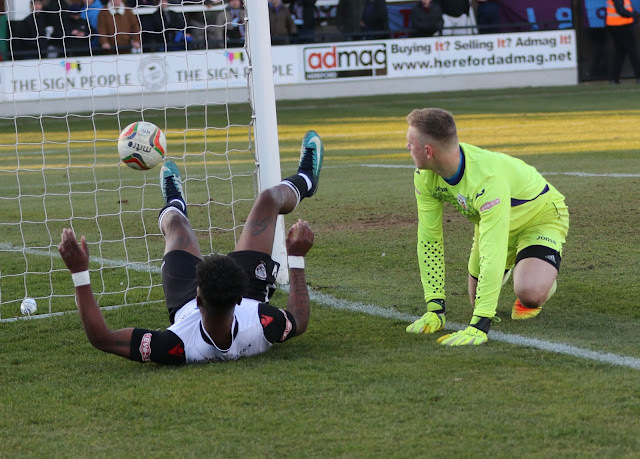 Striker Gavin Williams stepped up to take the penalty, and beat goalkeeper Mark Smith to give Hereford United a one goal half time lead. 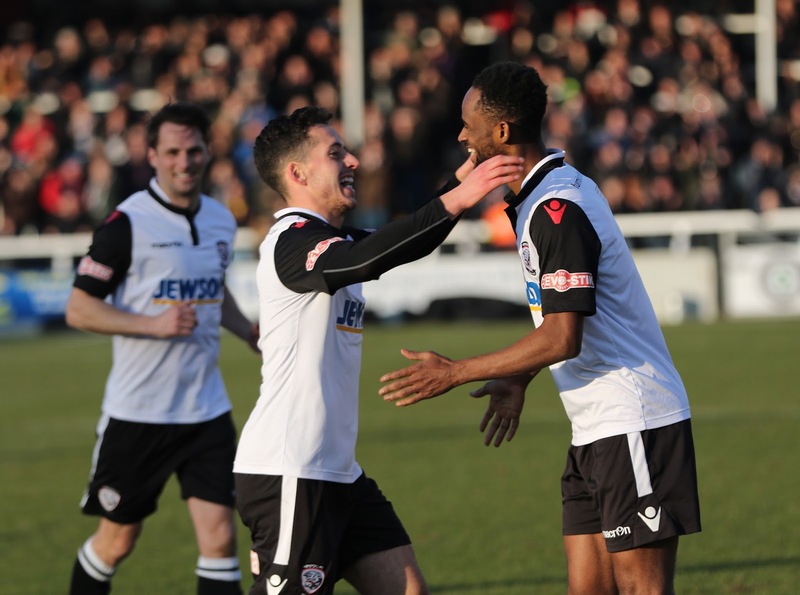 Usually coming out after the break means a fresh, lively Hereford United side! Not tonight, as the Bulls retreated to a defensive situation, allowing a neat Morecambe side, managed by former Hereford favourite Jimmy Harvey, to pressurise the Hereford goal and they made the Bulls' backline work to keep the score down. Scott Cooksey was in good form to keep Morecambe at bay, but attack after attack showed the perseverance of the away side. Drummond headed just wide from close range on the hour, showing how close the Lancastrians were to gaining an equaliser, something which they deserved. And they got one with nineteen minutes left through Stewart Drummond. A cleared effort fell to to Drummond who hit a rasping shot from twenty yards past Cooksey and into the corner. The defence was left shell-shocked and Cooksey was helpless to rescue the ball. The away side continued to dominate, and even the introduction of Steve Bull made little effect. Gavin Williams moved into Rodgerson's position, who came off, and he was of less use out wide. Extra time was inevitable, and Elmes looked tired. 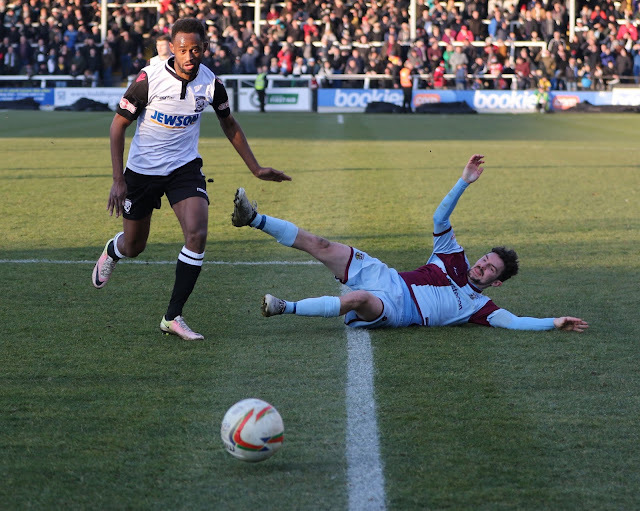 He was not replaced by Graham Turner as Hereford continued to be second best to the part-timers. It was a huge shock when they almost scored with a twenty five yard shot. It was straight at Scott Cooksey, but the Hereford 'keeper turned it onto the crossbar before it dropped on the goal line into his arms. Morecambe then must have realised that it wasn't going to be their night, especially after several missed chances! The penalty shoot out was always going to be a tense moment when taking into account Hereford's record from the spot this season! 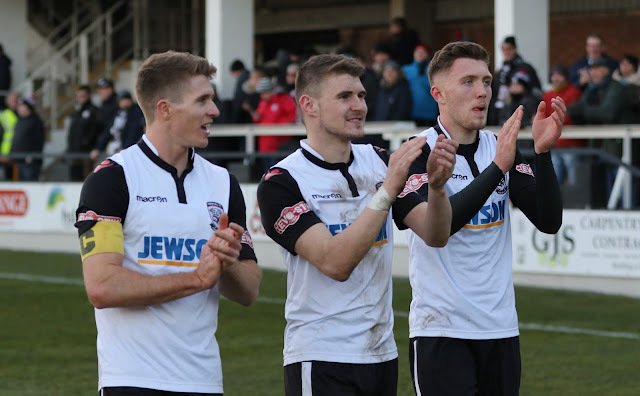 However, Williams, James and Quiggin scored, whilst Wall has a penalty saved to put Hereford through by three goals to one at the Blackfriars End of the stadium. Morecambe's penalties had just a 25% success rate. Substitute Phil Eastwood hit the first spot kick wide, and then Cooksey saved Andy Fensome's effort. Mark Quayle then missed, and Drummond's effort was not enough as Jimmy Quiggin beat Smith to put the Bulls through. An attendance of 1,373 turned out, perhaps not a high as expected due to the cold weather and more importantly, the foot and mouth crisis which has hit the area. 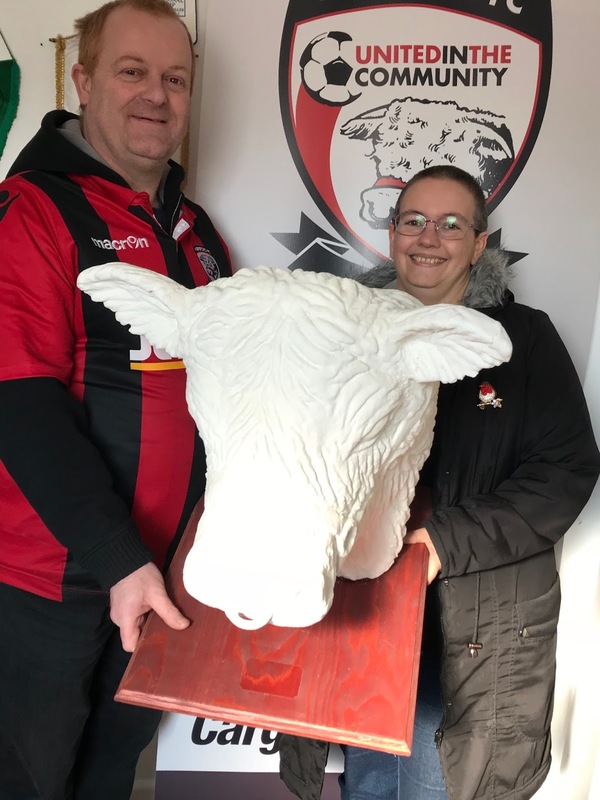 A farm in Llancloudy, near Ross-on-Wye, had been hit by the disease and with the cattle market a stone throw away from the Edgar Street ground, it would be not surprise if many farming families decided not to make the trip. Hereford - Cooksey, Clarke, Sturgess, Robinson, James, Wall, Rodgerson, Snape, Elmes, Williams, Quiggin. Man of the Match - James Quiggin. The Premier League is behind a proposal to have a two week winter break which will mean that fifth round FA Cup replays may be scrapped. The idea being put forward is for a break in the first two weeks of February but only for the Premier League. Other Leagues would continue as in the past. However the fifth round of the FA Cup might be moved to mid-week. And the tie would be settled on the night. Some clubs are concerned that the idea of no Cup replays might be extended to other rounds of the competition. Paul Tisdale, the manager of League Two Exeter, told the Guardian that abolishing third- and fourth-round replays would be disastrous for lower league clubs. “I see both sides of the fence with fifth round,” he said. “I can see from the top end they think there’s too many games but it would certainly be to the detriment of lower league clubs particularly if replays were scrapped in rounds three and four – that would be a very sad day. Hereford FC are expected to be crowned the Southern Premier League team of the month for February. They played six games during the month and won every one of them. 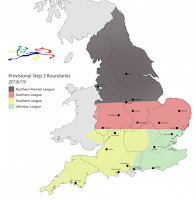 The league boundaries for step three and four of the non-league pyramid have been announced by the FA. A new step three central division will be created next season, which Hereford could be in should they fail to secure promotion to the National League. Ian White has been named as the new chairman of Weymouth, saying it was something he never dreamed he would be able to do. White has been involved with the Terras for 22 years and takes over from acting-chair Alan Pepperell. 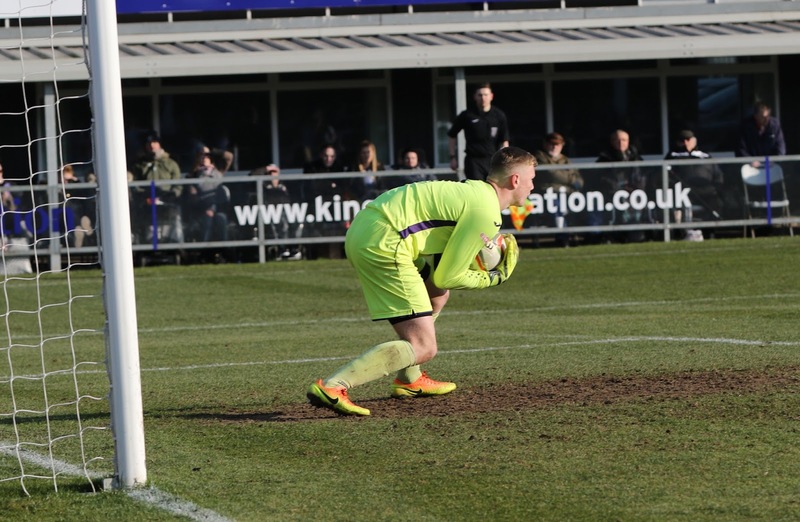 Gosport Borough have signed goalkeeper Mark Childs on loan from Eastleigh as the side look to avoid relegation from the Southern Premier. Childs is coming back from injury after damaging his ACL while on loan at Boro this time last year. 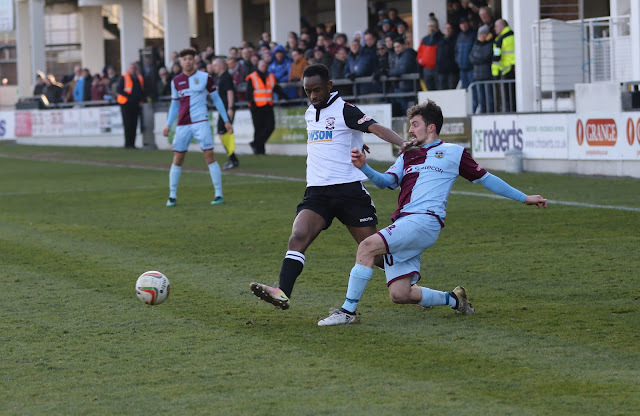 He started between the stick for the league's bottom side on Saturday as they lost 1-0 at home to Stratford Town. The campaign to raise funds to install a 3G pitch at Dorchester Town has been a success. Supporters were encourage to buy a square of the pitch for £50, which would then be matched by both the Town and County Council. After all pitch squares were sold within just three days, the club added a further 40 squares to the main stand and terraces, and these have now also been snapped up. Billericay Town have reinstated manager Glenn Tamplin following his resignation on the weekend. Tamplin said he would sack himself should his side fail to beat Wealdstone in the FA Trophy on Saturday, with the Blues losing 5-2. But he will resume his duties until the end of the season, with a club statement saying the players have insisted Glenn stay on. Despite losing three of their last four games, Billericay are top of the Isthmian Premier Division table and are into the final of the league and county cups. 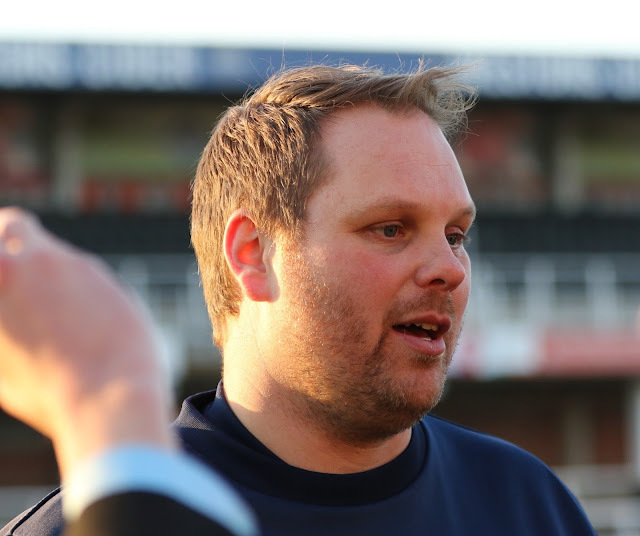 Sean Edwards is to stand down as manager at Westfields, who recently played in the same league as Hereford FC. He said that he hadn't been able to commit as much time to the club as he would have wished. Several players have recently moved elsewhere and the club has dropped into the bottom half of the Midland Premier League. 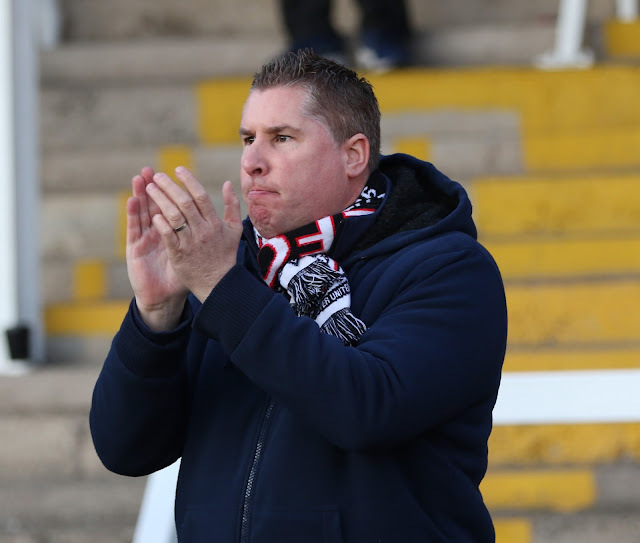 Chief executive, Andy Morris, praised Edwards for his time with the club. "He led us to our 50th anniversary and FA Cup giant-killing season with style and huge success for which he will never be forgotten," Morris told the Hereford Times. "I am delighted that he is staying with the club but sad he has stepped down from team management. "But I understand and accept his decision. 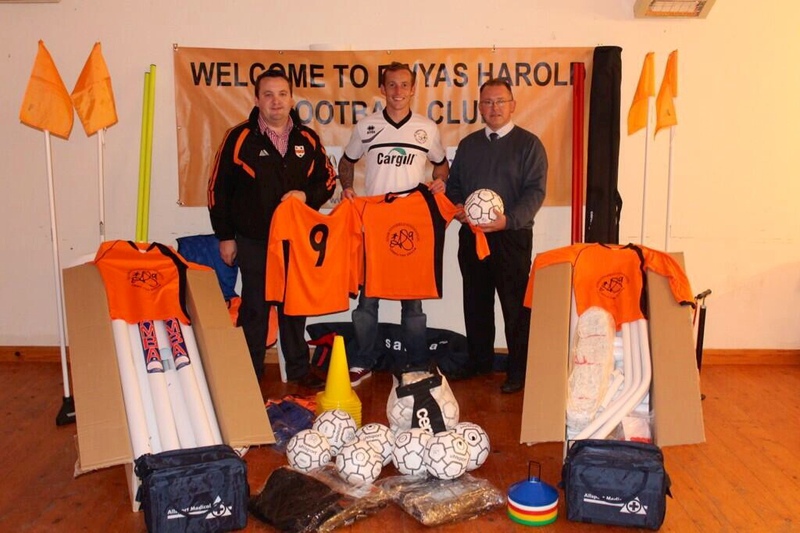 He is a great guy and will continue to have a big influence on the future of Westfields Football Club." The cold snap, dubbed the 'beast from the east', has caused all but one of tonight's Southern Premier games to be postponed. Royston were due to host Slough Town this evening, but a frozen pitch at Garden Walk has seen that game postponed after a pitch inspection this morning. Likewise, Redditch United's trip to St Ives has also been called off. The league's bottom side Gosport Borough were due to face Bishop's Stortford (20th) but this game has also fallen foul of the weather, with snow covering an already frozen pitch. Tiverton vs Slough has also been called off, and the remaining game between Stratford and Hitchin is subject to a pitch inspection early this afternoon. Meanwhile a reminder that tonight's HFA County Challenge Cup semi-finals have been postponed. Tonight's HFA County Cup game between Hereford and Ewyas Harold has been postponed due to a frozen pitch. The game will now be played on Tuesday 27th March. The other semi, Welington v Lads Club, has also been called off. Weather permitting Ewyas Harold are the visitors to Edgar Street this evening for a semi-final tie in the HFA County Cup. Hereford manager Peter Beadle is set to field a team of players needing game time and a few youngsters. Keeper Will Puddy is expected to make his debut for the Bulls. Also expected to start are defenders Jack Deaman and Jordan Liburd. In midfield Mike McGrath who has been out since November should start probably alongside Billy Murphy. Beadle has also said that Jamie Cuss will feature. Recent signing Jennison Myrie-Williams will start upfront. 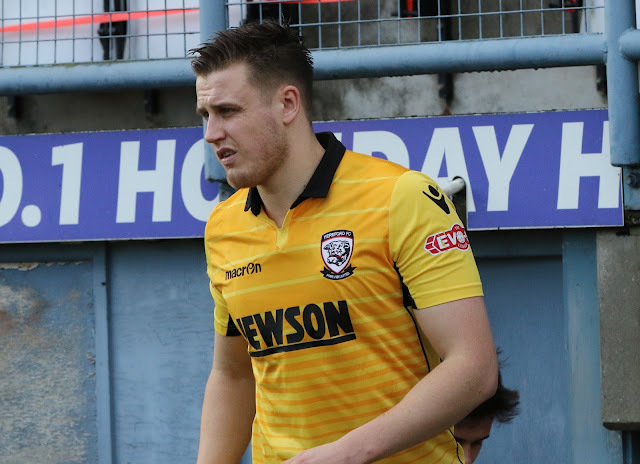 Beadle said after Saturday's game that he needed more minutes to improve his fitness. Since reforming, the Bulls have been back-to-back winners of the cup. During the nine games they've played, they've scored 46 goals and conceded just four goals. The biggest win came in the last round against Tenbury United, as Pete Beadle's side cruised through to the semi-finals with 15-1 win. Ewyas Harold are looking forward to the challenge. They play in the Herefordshire County League and currently lie third in the table. They recently drew 2-2 with Wellington Rangers in the league, in what was a game of two halves. Manager Malcolm Watkins admitted it was a close game and it's shaping up to be a good end to the season. "It was a closely-fought game between two good sides with different qualities. It was a good match and when you’re two-nil up at half time, you’ve got to think you’re going to see the game out. "Wellington never gave, they never give up, so fair play to them. It’s close at the top of the prem and it’s putting some excitement back into it locally. It’s making a really good climax to the season." In 2013, the club secured a grant from the Adam Stansfield Foundation, which Hereford fans will be familiar with. Following Stanno's death in 2010, the foundation was set up and aims to support young people in Devon, Herefordshire and Somerset by the provision of grants and facilities for playing football. help enable local children to take part in football. Rob Williams is running an auction for some Manchester United tickets in aid of St Michael's Hospice. My late father spent a month at the hospice two years ago so your support is greatly appreciated and he was a United fan as well (both Hereford and some cheap imitation from around Salford). The tickets are for the Sir Alex Ferguson stand. I am auctioning the tickets off via a silent auction and if anyone would like to bid please either email me on rob_williams79@hotmail.co.uk or text me on 07581 008601 with your name, contact number and your bid. Currently the top bid is £100. 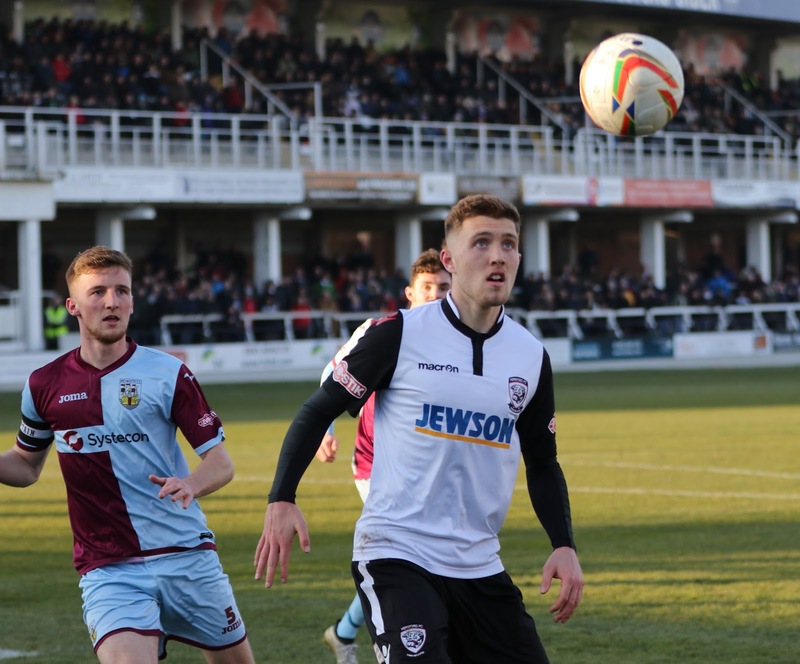 Calvin Dinsley is leaving Hereford FC. He's not played recently because of injury and manager Peter Beadle has suggested he gets some game time at another club. "Gutted to have left Hereford F.C." said Dinsley. "Love the lads and loved playing for the club. Need to take some time away from football before coming back stronger and fitter than ever! 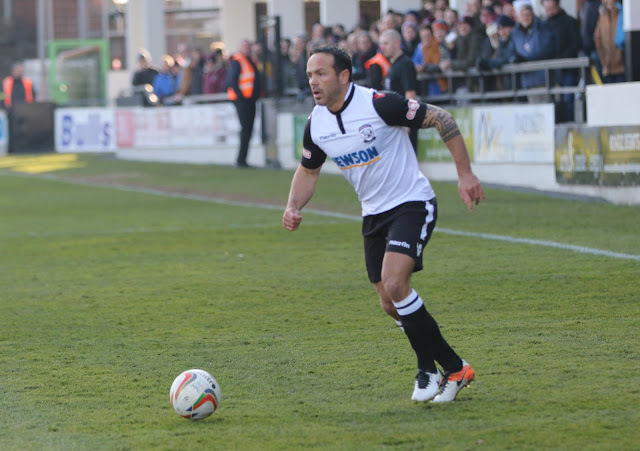 "Huge thank you to everyone involved with Hereford for their support throughout my time at the club. Up the bulls." Whilst Hereford FC are in HFA Cup action tomorrow evening, there are five fixtures in the Southern Premier League. Given the weather they might not all get played, but whatever the results, Hereford will still be top of the league. Hereford's next Southern League game at Edgar Street is set to be played on March 10th when King's Lynn are the visitors. 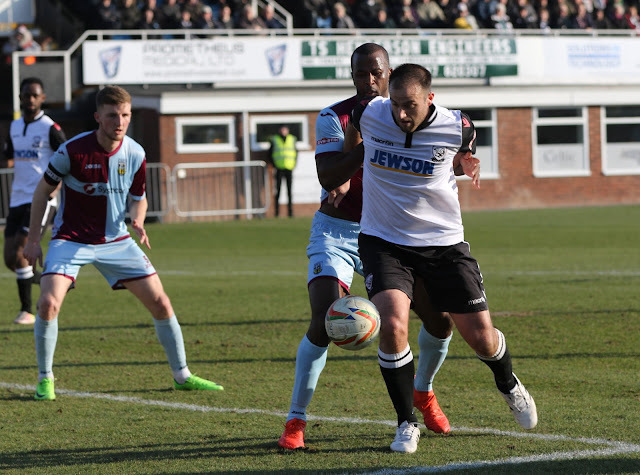 Hereford FC manager Peter Beadle has revealed that he has told both Calvin Dinsley and Garyn Preen that they can move to other clubs to get game time. 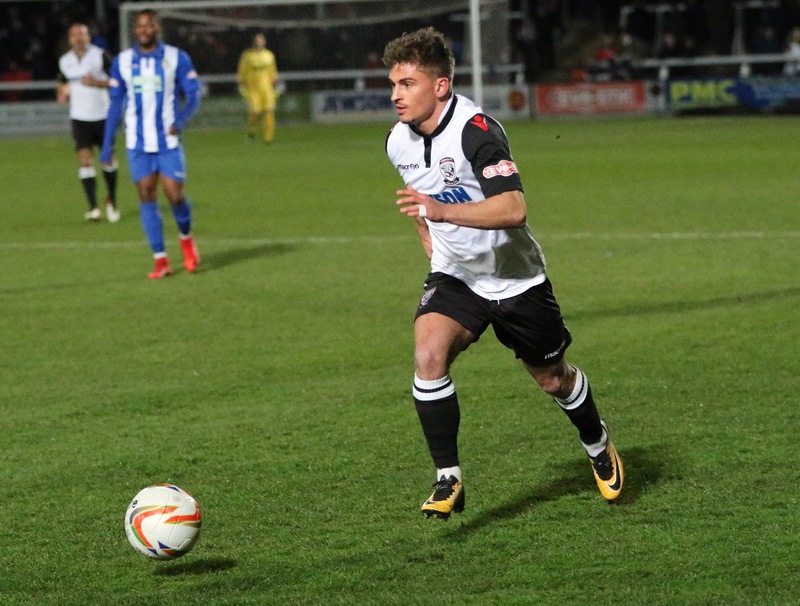 "Calvin is an important part of our squad when fit but he has struggled to maintain fitness this season, said Beadle as reported by the Hereford OS. "We need him to go out and get his fitness back then we’ll look at him again in pre-season. "Garyn has acknowledged that, at the moment, he will struggle to get back in the team with everyone fit. "We’ve both agreed that he will go out and play elsewhere to rekindle the levels of performance we saw earlier in the season." A selection of pictures from the first half of Hereford's match against Weymouth on Saturday. A big thank you to Nick & Naomi Sprague who were the winning bidders for the UITC Bulls Head! 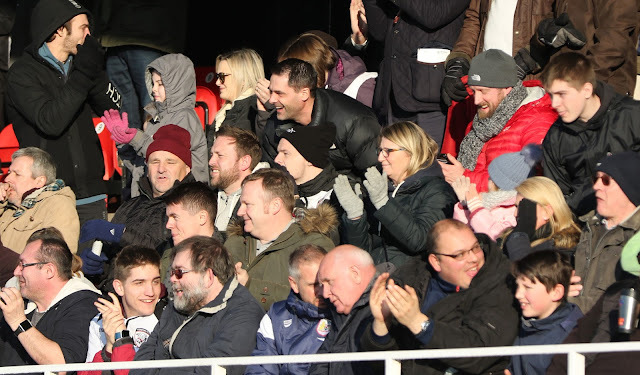 Some photos from around Edgar Street yesterday. A selection of pictures from the second half of Hereford's 2-0 win over Weymouth. Why are our broadspeeds so slow this evening? 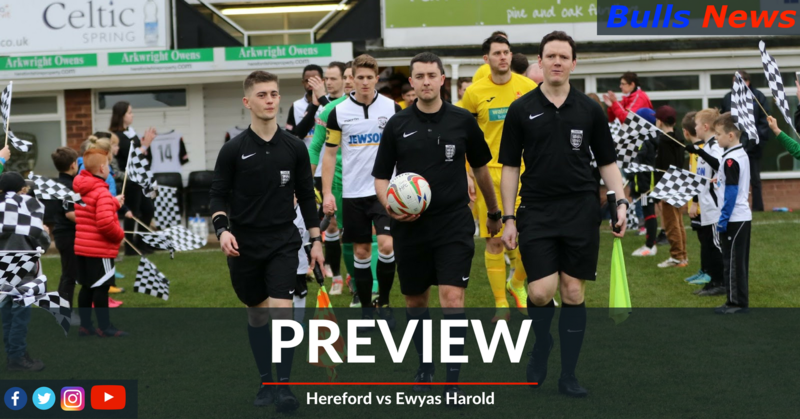 Hereford FC are hopeful that Tuesday evening's HFA Cup Tie against Ewyas Harold will go ahead. Manager Peter Beadle wants the game to give some of his players who have not featured regularily recently some game time. And if the game is not played it will be at least March 27th before it can be played given every Tuesday before that date already has a game set to be played. Given that the weather is expected to turn colder, the club are hoping to put down frost covers on the pitch tomorrow morning at 11.30am and have asked supporters to help. 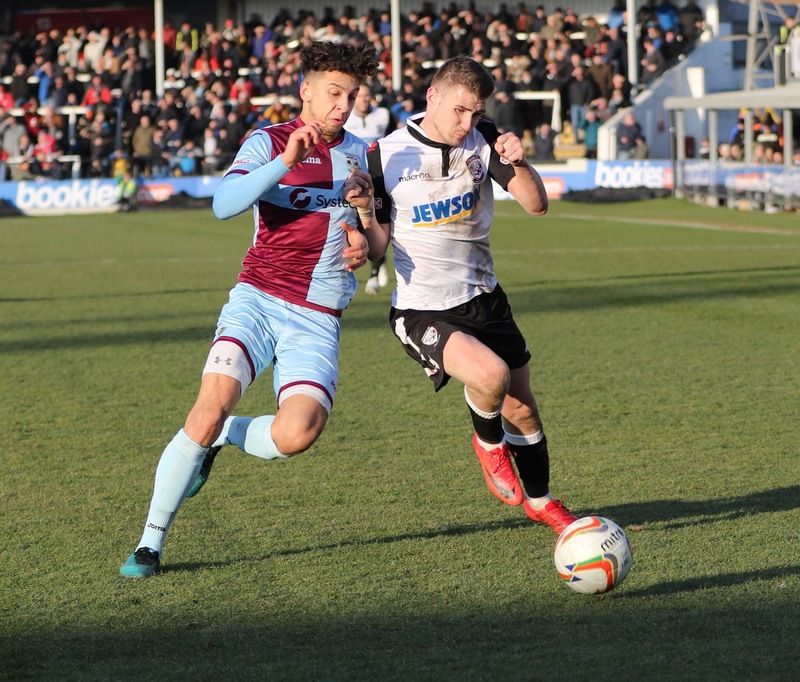 The game billed as “Match of the day” in the Southern Premier League failed to live up to the hype, though Hereford will be delighted in the way they brushed aside third placed Weymouth at Edgar Street this afternoon. 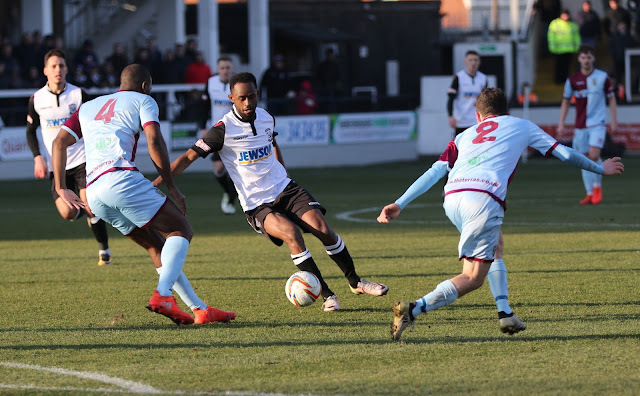 The Whites made two changes to the starting 11 with Cameron Pring making way for James Bowen and Jamie Bird for Edgar Street returnee Jennison Myrie-Williams. With the sun shining brightly towards the Meadow End, Hereford swapped ends and made no delay in taking the game to The Terras. 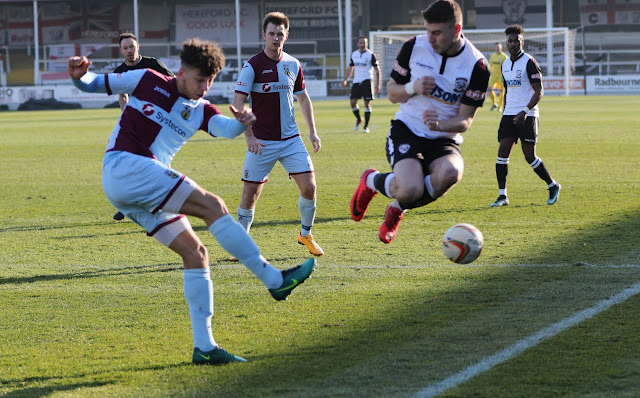 Hereford’s width proved a great outlet early on and crosses from Jimmy Oates and Keyon Reffell were dealt with, whilst Mike Symons had a shot blocked. 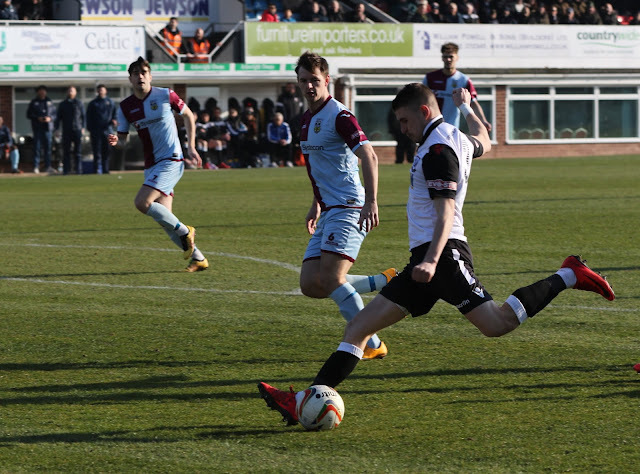 Bowen had a good half at left back, driving forwards regularly and delivering difficult crosses in to the box for the defence to deal with, not helped by the afternoon sun. Pablo Haysham forced the first save of the game from the ‘keeper, though it was a tame effort straight down the middle on 20 minutes. 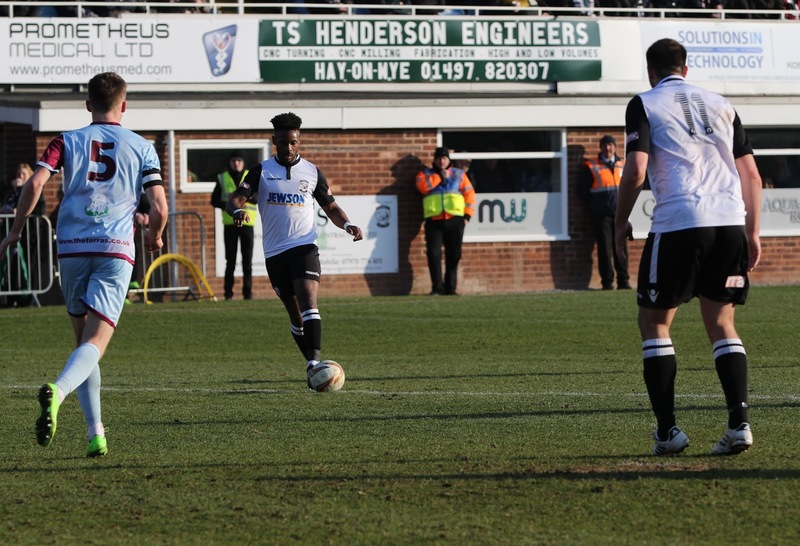 Oates flicked a second delivery, after a poor corner, dangerously towards the back stick but nobody was able to meet it, before Myrie-Williams crossed towards Haysham who couldn’t connect from 10 yards. On the half hour mark the leagues top scorer Brandon Goodship had his most notable moment of the game, picking up a yellow card for his third offence, clattering an opponent following a long ball forwards. Two minutes later, the much more effective Symons span in the box and forced the ‘keeper in a save, turning around the post. Eliot Richards came closest in a dominant first half for the Bulls, his effort from the edge of the box was driven low just beyond the far post before Oates saw another effort deflected behind for yet another corner. Despite their supremacy, The Whites couldn’t capitalise before the break and so the two sides went in level, a score line the away side will no doubt have been pleased with! Hereford started the second half in similar fashion and 5 minutes in Myrie-Williams was down in the box for a third time of the afternoon but his claims for a penalty were once again waved away. The debutant soon made an impact however and what an impact it was. The Bulls built another attack on the right, the ball made its way to Myrie-Williams who looked up, 25 yards from goal, before rifling a left footed thunder-bolt in to the back of the net, via the crossbar, which is probably still staking at the Blackfriars End! 1-0 to The Whites! 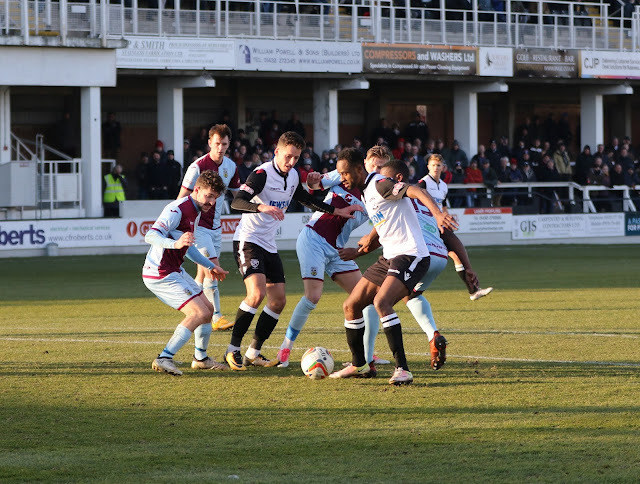 Hereford didn’t hold back and almost had a second 5 minutes later; the best attacking move of the game involving Oates, Purdie and Symons who held the ball up in the box and layed it on to Heysham, who curled his shot narrowly wide. 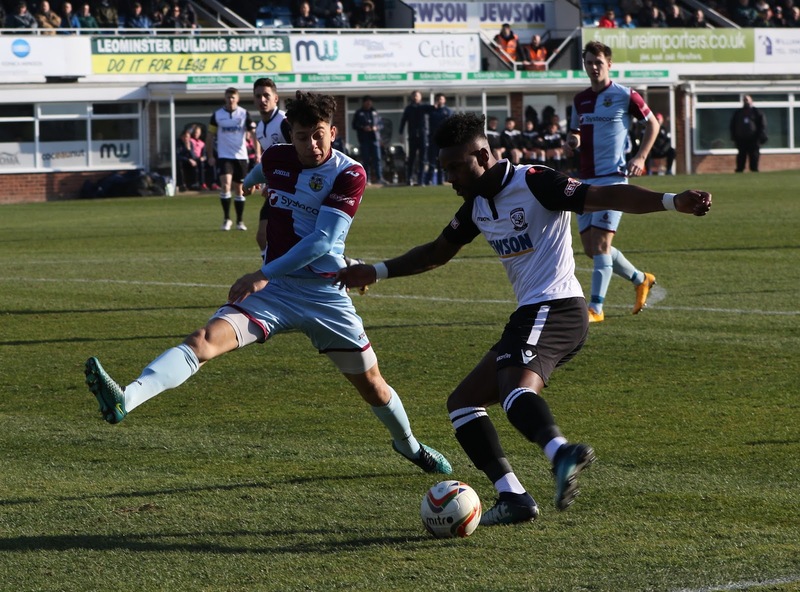 Weymouth were not able to withstand the pressure for much longer and on 68 minutes the lead was doubled. Myrie-Williams again went down in the box, this time looking more like a justifiable claim, but the Bulls retained possession and won a free kick on the left for a foul on Bowen. The ball was crossed and fell eventually to Heysham, who manoeuvred the ball to the left of the box where Reffell drilled a low shot through a defenders legs and in to the back of the net, via the ‘keepers fingertips. 2-0! With about 15 minutes remaining, Peter Beadle made two changes, bringing Myrie-Williams and Haysham off for Billy Murphy and the returning John Mills. This may seem a one-sided report so far and, if it does, it is a fair reflection of the game! 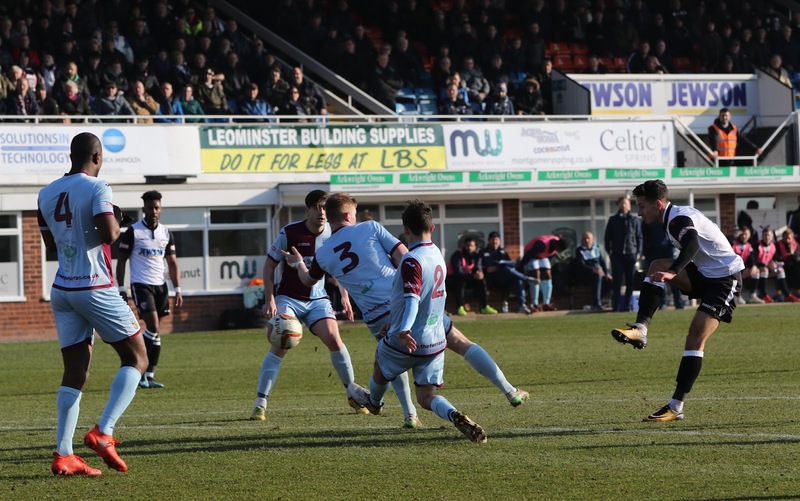 It took until 83 minutes for Weymouth to register a shot which was dragged harmlessly wide by Goodship in his last act of the game before being replaced. 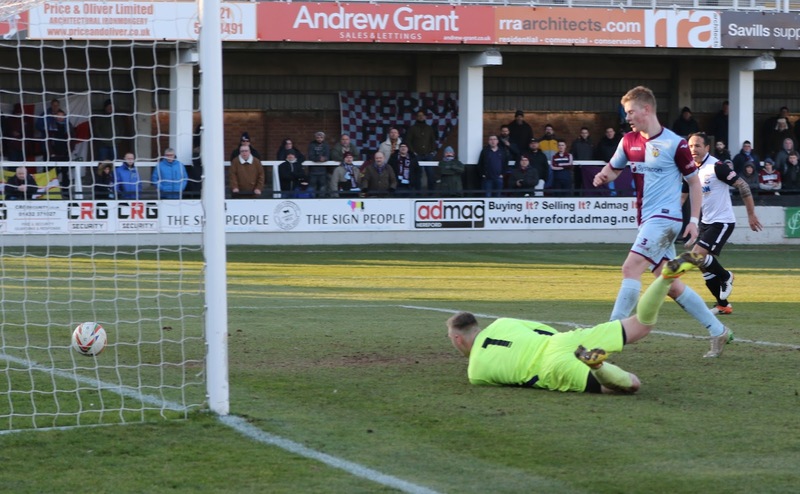 Martin Horsell had a very quiet afternoon in goal (not having to make a save), but faced the biggest threat in the 89th minute as Weymouth were awarded a free kick 20 yards out. The wall did its job and the free kick from Lewis Harvey deflected off Rob Purdie and went behind for a corner, which again was easily dealt with. The free kick was given away by Dara O’Shea, his only mistake in what was an otherwise immaculate performance by the young West-Brom loanee. He, and Ryan Green, more than dealt with the threat of the league’s top scorer and O’Shea portrayed calmness throughout as well as impressing when in possession. A man of the match performance from the young Irishman. A quick note for Mills, who almost raced clear in the last minute before attempting his classic “chop” but seemed to be held off by his marker when attempting to run beyond him; we’ll put it down to a little lack of match fitness. A final mention for the away supporters in a crowd of 2,767, there looked to be about 100 or so of them, however they didn’t make a peep all game and probably wish they hadn’t bothered! 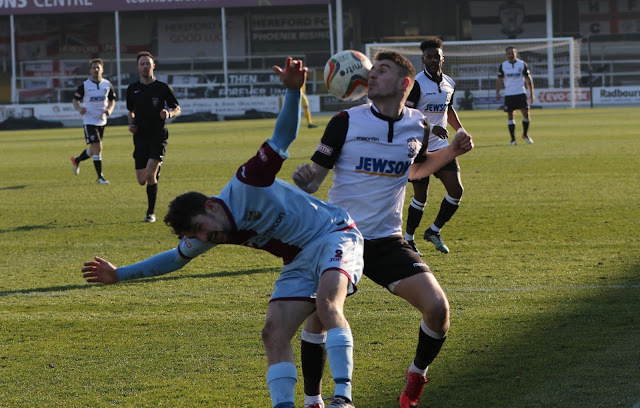 A hard-working and professional performance, though by no-means a classic, from Hereford today but the 2-0 result against third-placed opposition has to be seen as a very good one. Particularly as Kings Lynn (2nd) and Kettering Town (4th) lost, meaning Hereford are top of the tree by 7 points, still with two games in hand! Hereford: Horsell, Oates, O'Shea, Green, Bowen, Richards, Purdie, Reffell, Haysham, Myrie-Williams, Symons. Subs: Bird, Mills, Deaman, Murphy, Puddy. Sponsors Man of the Match: James Bowen. Today's Southern Premier League Review written by Steve Whitney. 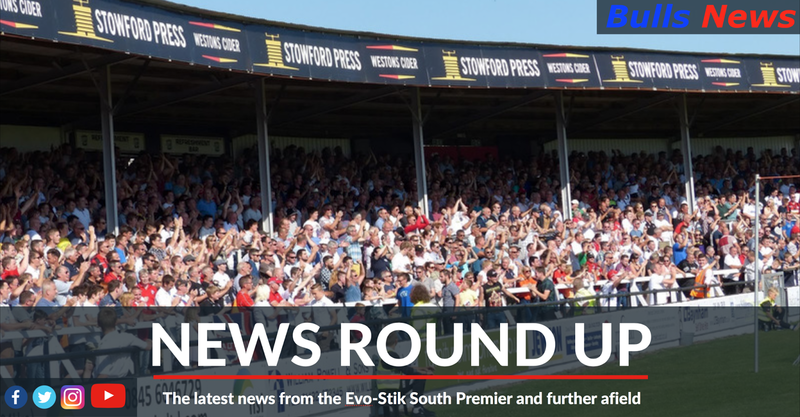 Saturday proved a very good one for Hereford FC as they beat one of their promotion rivals in Weymouth and saw fellow contenders King`s Lynn Town and Kettering Town both lose to leave the Bulls seven points clear at the top of the Evo-Stik League South Premier table. 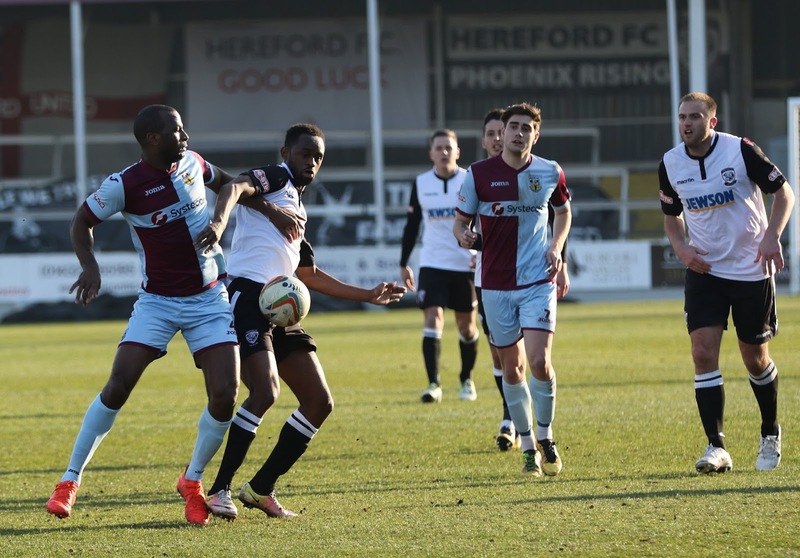 Hereford`s newest recruit, Jennison Myrie-Williams, signed this week following his release from Vanarama National League side Torquay United, opened the scoring to break the deadlock 10 minutes into the second half. And then Keyon Reffell doubled the Bulls lead on 69 minutes to confirm victory in front of a splendid crowd of 2,766 at Edgar Street. King`s Lynn made the long journey to Devon to take on a Tiverton Town side who had been beaten by Kettering at Ladysmead in midweek. But the Yellows moved back to within five points of a top five spot, thanks to a late, 87th minute Tom Bath winner. However, the Poppies weren`t able to follow up that good win at Tivvy as they were beaten 2-0 at the Meadow by a Chesham United side who are now fifth. After a goalless opening 45 minutes, the Generals broke the deadlock in the 68th minute through Lewis Toomey. And a second from Shane Bush with 11 minutes remaining killed off any hopes of a Kettering comeback. Slough Town are just a point behind Chesham in sixth after a 2-1 Arbour Park win over mid-table St Neots Town. The Rebels got off to a great start with a goal inside the opening minute from recent signing Perry Coles. And Coles, making his home debut, made it 2-0 with a minute to go before the break. However, in first half injury-time, Nabil Shariff reduced the deficit to give the Saints hope. Slough held firm in front of 615 to keep in the play-off race. The same can`t be said for Banbury United though, who were held to a 1-1 home draw by fourth-bottom Kings Langley to fall six points behind the top five. It looked though as if Elliot Sandy`s goal 11 minutes from time was going to be enough for the Puritans, but Jorell Johnson popped up with an equaliser for Kings 4 minutes into stoppage time. There was another defeat for bottom-markers Gosport Borough as Lee Thomas` goal 4 minutes into the second half proved to be enough for Stratford Town at Privett Park. Second-bottom Dunstable Town pulled four points clear of Boro after earning a point from a 1-1 draw at the Avenue Stadium against Dorchester Town. Ashley Pope gave the Magpies a 33rd minute lead that Charlie Black levelled 6 minutes into the second half. Elsewhere, an early 5th minute Guri Demuria goal eventually proved enough to give Basingstoke Town the points at the Camrose against Hitchin Town, while a Jack Bowen goal 8 minutes before the break did likewise for Biggleswade Town at the Carlsberg Stadium against Redditch United. Frome Town suffered a fourth successive defeat, 4-0 at the Pro-Kit against Bishop`s Stortford. Afolabi Akinyemi after 16 minutes had the only goal of the opening half. He scored again 8 minutes from time and that was sandwiched by a pair of Jamie Cureton efforts on 70 and 79 minutes. Third-bottom St Ives Town suffered a 4-2 home defeat to Farnborough. After leading through a 19th minute Tom Knowles effort, the Saints found themselves 3-1 down to goals from Connor Calcutt and an Andrew Harris-Sealy brace. Dubi Ogbonna reduced the arrears to one in the 65th minute, but Michael Elias-Fernandes made sure for Boro with a fourth 18 minutes from time. 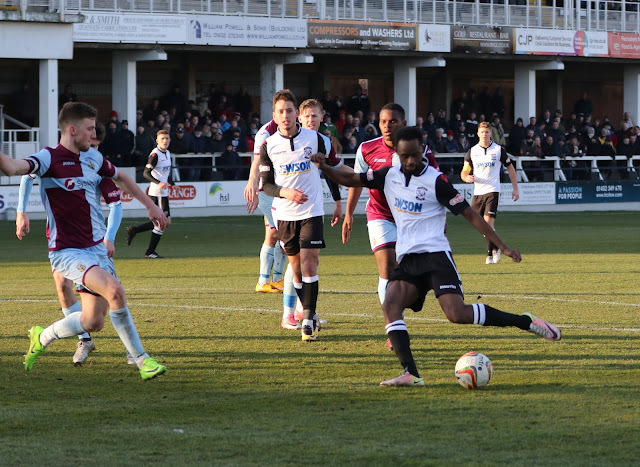 Keyon Reffell scored Hereford's second goal in the match against Weymouth this afternoon. "We think it was a great win," said Reffell. "Very solid performance from back to front. Defence kept them quiet all game. "I think their style of passing suited us down to the ground. "Not many teams come here and try to play football so hats off to them. "First half was a bit frustrating as we were getting in good positions but we weren't getting the final ball." Jennison Myrie-Williams score Hereford's first goal. "Great finish, perfect, just what we needed at that time in the game." 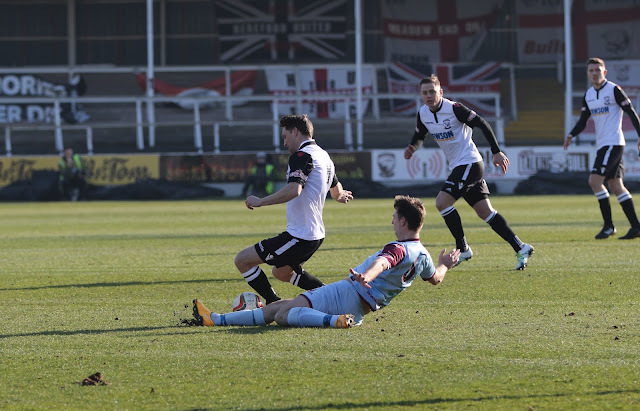 And Reffell scored Hereford's second goal. "It just dropped in the box and I turned and seeing there was no one in front of me I got my shot off and it's gone through the keepers legs and gone in the corner. Happy with that. "We're aware we're seven points clear but we take it game by game. We don't want to get carried away ourselves because you never know how other teams might do." 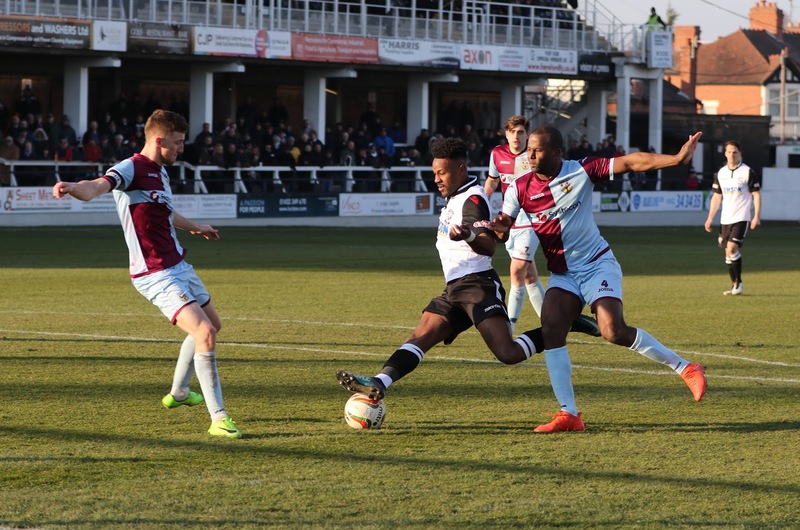 Jennison Myrie-Williams returned to Edgar Street this afternoon anmd scored Hereford's first goal of the game against Weymouth. "It's good to be back playing football,"he told BBC Hereford and Worcester. "The main thing today was to get the three points. "Today was the first time I'd seen the boys, they've greeted me well as soon as I walked through the door. "I enjoyed it, I like to score goals and create goals. Nice to pull it off and even better to get the win. "It opened up for me so I moved it to my left foot, luckily for me it went in and I'm really happy with it. "I'm just trying to build my fitness up now and do what I do for longer periods in a game. It will take a few games to get me up to speed. "I enjoyed the challenge on the pitch today." This afternoon's results in the Southern Premier League saw promotion contenders King's Lynn, Weymouth and Kettering all lose. Royston v Merthyr - Postponed.